Hi Guys, I recently heard about this lot, and would very much like to know more, can anyone give me any details. I see that they were SS, did they have tanks? What was the highest rank they held? 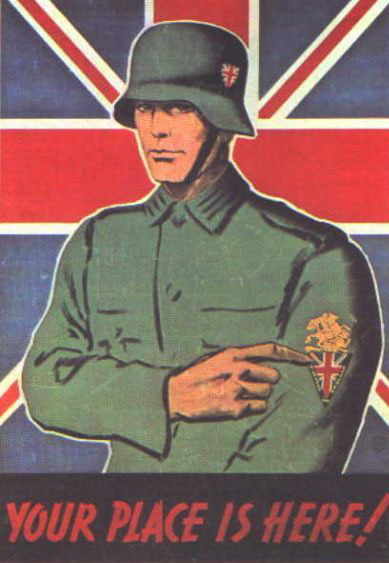 Britisches Freikorps was formed Jan 1943 as St. Georgs-Legion and was made up of British and Commonwealth volunteers. The forming of a British legion was first suggested by John Amery, son of Leopold Stennet Amery, Secretary of State for India in Winston Churchill's war cabinet, who also made a failed attempt to find volunteers for the unit. Himmler became interested in the concept and a renewed attempt to find volunteers were made, but only approx 30 soldiers volunteered for this unit (including 3 Canadian, 3 Australians, 3 South Africans and 1 New Zealander). It was renamed Britisches Freikorps Jan 1944 and attached to III SS Panzerkorps Feb 1945. The unit never saw any action, but a few men from this unit are believed to have fought in the battle of Berlin attached to 11. SS Freiwilligen-Panzergrenadier Division Nordland. The proclamation written by John Amery when the Legion of St. George, later renamed British Free Corps, was founded. The "British Free Corps" cuff title was authorized for this unit. The collar tabs used in this unit shows three leopards. An armshield with the Union Flag was also used. That a smashing website, thanks for showing it to me!!! Despite how much we may joke about it, Wikipedia is (sometimes) not a bad place to look. a very good read is "RENEGADES, HITLER'S ENGLISHMEN" by Adrian Weale. ISBN O-297-81488-5 published by Weidenfeld & Nicolson, 230 pages. They were designated for the dirty task of helping to remove the bodies after the fire-storm on Dresden. Alfred Minchin second right. former merchant seaman. Kenneth Barry second left. got a nine month sentence. note the Union Jack flash and armband. 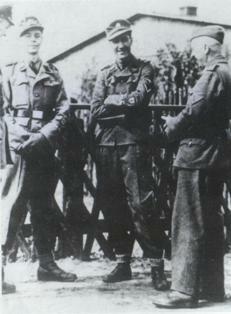 BFC 2a Thomas Cooper Waffen-SS and British Free Corps. (kray-twin lookalike) life imprisonment realesed from prison January 1953 believed to have gone to live in Japan! BFC 2d Francis MacLardy formerly a sergeant of the RAMC who joined the British Free Corps. (ID CARD) sentenced to life commuted to 15 years. Very interesting unit as Ed notes. I wonder if they lacked conscience and character or were totally duped or motivated by something else entirely? May people do things for reasons that made complete sense at the time. And it is sometimes difficult for us to critique them and their actions decades along. For the INA (those I know best), such a step made sense. And some French, Dutch, and Finns (among others) joined the Nazis after all. I struggle for find much coherent sense for the (non-Irish, non-Scots) British (other than to escape from POW camp). (If we can ignore the fact that many -- even today -- endorse and support the Third Reich and its agenda!) We need to know much more than we do about these Britsh "volunteers", all 30-or-so of them, we need work by serious historians. It may be too late to do so? If I recall correctly Himmler wanted to originally call them the British Legion. That was until it was pointed out that there was already a British Legion (British Ex Servicemans Organisation) !! Somehow, I doubt Himmler would have cared, or known enough English to care, . . . He was too busy chasing his clinically lunatic schemes, such as Hitler being the maahdi or a bodhisattva of Maitreya (I have seen both in the RF-SS documents). No wonder they lost! 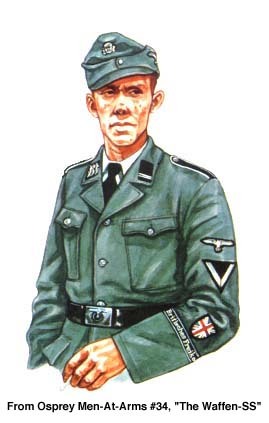 Check out the uniforms of the British "Black Prince" Waffen SS in the 1964 alternative history film, "It Happened Here." Superb uniforms, possibly the best ever invented for films. who was going to win the war. It was not ever as inevitable or as obvious as the gift of history to us suggests. Current events will look remarkably different to the generation born after us, who will have the benefit of hindsight. it is always "today" to the people living it. Location:Burnley , Lancashire , England . One of the volunteers for the British Free Corps actually came from my home town of Burnley !! His last name was Turner a Royal Engineer who was a POW and was caught getting rather friendly with a German woman when working out of the camp ! He had the option of being shot or joining the SS , hhhmmmm what a choice !!! Cheers guys, it was very interesting reading all your comments. Thanks everyone. Are there any known surviving members? There was a documentry on British television about them and they tracked down a surviving member to Austrailia naturally he didn't want to talk much or be seen by the camera i think mainly because he was drawing a war vets pension from the state ! I was also told a full British Free corps uniform surfaced in an amateur dramatics costume department in New Zealand not too long ago but as soon as word leaked out about it it mysteriously disappeared ! into a collection somewhere no doubt !! Couldn't have said it better. What looks logical and necessary from today's point of view, depended actually on quite contingent circumstances in its time. And I don't think the "What if" question is just academic play. Well it also has be said, that thankfully all the other Allied P.O.W didn't feel like betraying their country just to have a cushy number and apart from John Brown who provided information for MI9: and Tom Freeman who disrupted the BFC at a crucial moment in its formation and escaped to continue the fight against the Nazi regime. "Investigation of the renegades continued throughout the summer of 1945 under the capable direction of Burt, Spooner and Scardon, and revealed, if it wasn't obvious what pathetic characters the majority were. The excuses that they gave for their actions were depressingly repetative*, most claimed to have changed sides to spy on the other traitors; or to sabotage the German propaganda effort and the British Free Corps. Only a few were prepared, (as Joyce was, Lord Haw-Haw) to face up to the consenquences of their actions. * They had enough time together to practise group alibi's espcially as the war drew to an end. The word "TRAITOR" fits the others, down to the ground, and as far as I am concerned as an ex-member of the army no excuse can be submitted for their actions, once you don the uniform of your country and take the pledge of alligance, wether to Queen or President, then you are in, through thick and thin. What would be interesting to know, was there any evidence that they tried to raise an American unit along similar lines?? people who SHOULD "know better" are quite capable of deluding themselves into believing literally anything they want to-- and facts be damned. Even a theoretically "rational" decision ("Do I want to be one of the winners or one of the losers?") is not necessarily MADE rationally. think of the House of Saxe-Coburg-Gotha falling over itself to morph into "Windsor" and the Battenbergs transforming into Mountbattens in Britain, and the xenophobic reaction in the United States which saw city directories in 1916 stripping every "German" accent mark in the 1917 editions (my own SWEDISH family being such a case, losing our ?" for 58 years until I put it back on). all of whom were regarded "equally" as "enemy aliens" by the dunderheads in London. America's mass internment of Japanese-Americans who had been blocked by race laws from becoming U.S. citizens falls into the same category of bureaucratic mindlessness. It is precisely that sort of dimwitted THICKNESS the Germans were able to finesse in both World Wars. Rick, I have been given to understand that most of the Japanese-Americans who were interred during WWII were already American citizens and their property was siezed without due process. Am I misinformed? who were then branded as "enemy aliens" because ... they were not citizens. i know that the germans did help arm the irsih rebellion in 1916 etc and that i think they also helped the ira in ww2 to start a bombing campigian on the british mainland but intrestling when the germans tryed to recruit/start a irish ss division the recruiter were beatin up and thrown out of the camps!! i saw that british programme on the free korps and it was very intresting as they were pretty much kept away from any fighting and they were more of a burdin then anytthing else! one guy did partisapated(?) in the battle of berlin but was killed! i read a great book called jackels of the reich again all about the brit free corps!! My fellow Dubliner Paddywhack is referring to James Brady, who took part in the Battle of Berlin but survived to be court-martialled, as a former British soldier, and jailed. His mate, Frank Stringer, was indeed killed in action but in the Schwedt bridgehead on the Oder Front. Brady and Stringer were Royal Irish Fusilier soldiers. 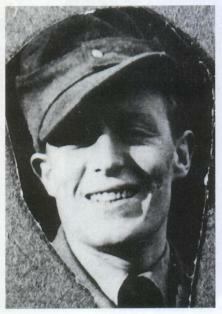 Born in Roscommon in 1920, Brady (Army Number 7043207) joined up in 1938. Their battalion was posted to Guernsey in May 1939 and he and his mate Stringer got into serious trouble the following month when they got drunk and beat up a policeman. Brady got eighteen months and Stringer twenty-one months. They must have nearly killed the copper. When war broke out, they petitioned to be allowed to rejoin their regiment but appear to have been ignored so they were obviously considered to be "a right pair". The Germans landed and Brady and Stringer became POWs. They were recruited in 1941 by the Germans to work against the British. To cut the story short, they ended up enlisting in the Waffen-SS in the late summer of 1943, according to Brady's pre-trial statement. Following training, they were sent to J?gerbataillon 502, which became SS-Jagdverband "Mitte". 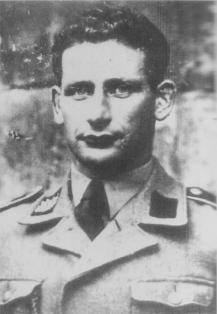 After three weeks in Romania in August 1944 blowing up bridges, their initial training with the Germans having been demolitions-oriented, they took part in the arrest of Admiral Horthy by Skorzeny in Budapest. Both men went with "Miite" to the Oder Front in January 1945. Stringer doesn't appear to have made it out of the Schwedt Bridgehead, according to James Brady's account. 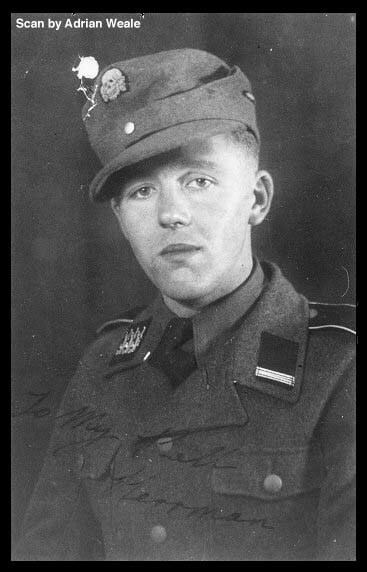 Brady and Stringer served in SS-Jagdverband "Mitte" and fought in the Schwedt Bridgehead on the Oder Front. 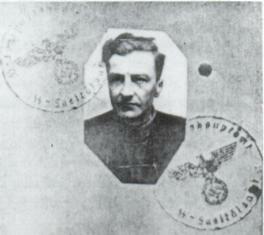 Brady then fought at Oderberg, where he was wounded and evacuated to Grunau, just outside Berlin. As the Soviets moved on Grunau, Brady and other walking wounded were taken into the city. Brady was again wounded. After the capitulation, Brady got out of hospital and made for for the American Zone, reaching it on 26.6.1945. He eventually turned himself into the British in Berlin in September 1946. There was also an attempt by Sir Roger Casement to form an Irish Legion in Germany during WW1. Casement had gone to Germany late in 1915 to organise both the arms shipments for the planned Easter Week uprising and the recruitment of this Irish Legion. In the end, the Irish Legion came to nothing as the handful of recruits were of a very low order indeed. In fact, many of them were consumptive. Casement tried to advise the rebels in Dublin to call off the uprising but was ignored and the rest, as they say, is history. Hitler was never very interested in proposals for an Irish Waffen-SS unit. 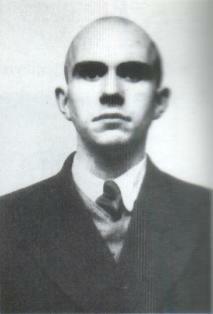 While he and his henchmen considered the Irish, and Celts in general, to be highly suitable for interbreeding purposes from an Aryan viewpoint, he throught the IRA was a bit of a joke by then and not as much cooperation occurred between hardline Republicans and the Nazi government as Pinewood, Hollywood and authors like Jack Higgins would have people believe. In any case, the Nazis' plans for the island of Ireland would have precluded the Irish nation remaining there: they planned, I believe, to 'absorb' those Irish deemed racially valuable into the Germanic Nation and to turn the whole place into one massive 'reception centre' for Europe's flotsam and jetsam.